South Broward County, Florida, is a place to live the sunny Florida lifestyle. With an abundance of attractions and wildlife, choosing South Broward townhomes and villas will put you close to the Everglades, Flamingo Gardens and more. With proximity to Miami and Miami Beach, living here against a setting of lush tropical foliage and nearby beaches exudes a bit of Paradise. Low monthly maintenance costs make townhome living affordable. Townhomes in the Davie area include Poinciana Parc and Harmony Lakes with two and three bedrooms and one car garages. One might also find family rooms and more; a walk to the nearby elementary school makes it so convenient. The location is close to the Sawgrass Expressway, Florida Turnpike and I-95. Miramar, Florida has townhome at Somerset and Nautica , which includes a clubhouse, jogging area, lake, gym tennis courts and easy access to Miami. Plantation townhomes and villas include Chelsea, Quatraine and Courtyards at Jacaranda. All of these are conveniently located near the Central Park sporting complex. Villa and townhomes in Weston are plentiful. Savanna offers one story villas with two car garages and easy access to the Weston Regional Park and YMCA. San Messina, San Mateo and San Sebastion offer large townhomes with patios and garages. All are located in lovely Weston Communities. One of the sixth largest in the country, the Broward County School District provides schools in South Broward County and your children will attend schools that promote diversity and fine education. For example, Weston is served by A rated schools including Indian Trace, Manatee Bay, Cypress Bay High and many more. Davie boasts excellent schools like Western High, Fox Trail and Hawks Bluff Elementary. Companies in Broward County include Gulfstream International Airlines in Ft. Lauderdale, DHL and other companies can be found in the Ft. Lauderdale area. 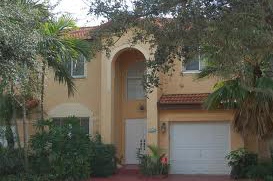 The South Broward townhome and villa lifestyle offers Florida living within an affordable and beautiful setting.